In case you missed the unusual cinematic confluence appearing in last week’s Calendar, dearest readers, allow us to revisit the details and their implications! Not one, not two, not three, not four, but five local productions had been scheduled to make their debut on various platforms during a 10-day period; we’re in the midst of it right now. Our community’s media creators could not have coordinated a more welcome parade of pre-Christmas activity in the C-U Blogfidential vein and, chances are, they didn’t even realize it! The television specials, both of them documentaries produced by WILL Channel 12, have already aired. Last night, Monday, December 9, the station unveiled COURSE WORK: DINNER SEASON AT PRAIRIE FRUIT FARMS, a family farm portrait produced/narrated by Lisa Bralts and photographed/edited by Tim Meyers, while last Thursday, December 5, they premiered WE ARE MONTICELLO, a citizen-filmed tribute to the eponymous Illinois village. CUBlog has previously covered the latter; the former demonstrates how the Prairie Fruits Farm and Creamery of Champaign grows, harvests, and prepares its crops and milk products for a signature dinner symbolizing the worth of “farm-to-table” foods. Both hour-long shows will presumably be made available for viewing on disc or on-line. The narrative feature films in this quintet have played public engagements before, but they have been revived for this week by their respective producers in support of imminent home video releases. Later tonight, Tuesday, December 10, director Jennifer Bechtel and her Hot Diggity Productions crew will encore their well-received “family coming-of-age comedy” SCARY NORMAL at the Art Theater Co-op, 126 W. Church St., Champaign, at 7:30 p.m. Admission to the show will be $6, while the brand-new DVD and almost-brand-new CD soundtrack will both be on sale for quite reasonable prices. Performing a brief set will be young C-U musician Kenna Mae Reiss, who appears on said soundtrack and in said movie! Laura Welle and April Cleveland star in SCARY as teen friends, surrounded by a lovably idiosyncratic collection of family and friends, who unexpectedly become smitten with one another. On Friday, December 13 (uh-oh! ), 8 p.m., the dark relationship drama HOUSE OF THADDEUS will chill audiences to the bone at the Kathryn Randolph Theater, 601 N. Vermillion St., Danville, in an event hosted by Roselawn Productions regulars Mike and Leslie Boedicker and Bill Kephart. The $6 ticket price will be split between funding the theater’s resident troupe, the Red Mask Players, and the filmmakers’ THADDEUS promotional efforts. The bad news is they can only accept cash or check for payments; the good news is we’re alerting you ahead of time so you can come prepared! Also bring extra for a copy of the DVD-R that will be made available for the first time at this show, or save up for the Blu-ray version scheduled to arrive next month, according to director Mike. Sales of those products will help fund their next endeavor. In THADDEUS, Kephart and Joi Hoffsommer lead an effective cast as a couple indirectly torn apart by the polarizing history of their new home and how townsfolk have interpreted it over time. 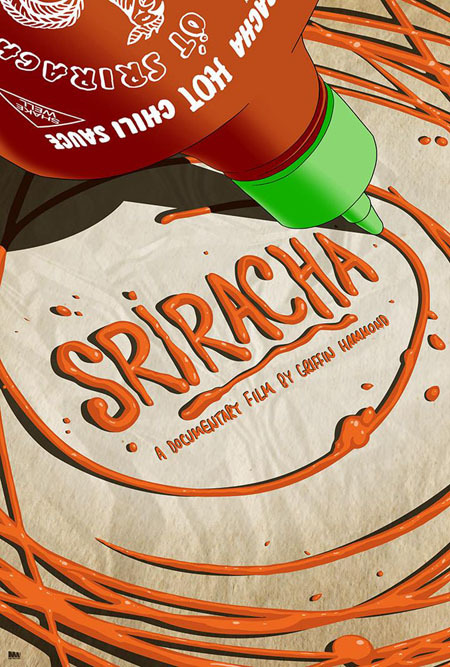 Finally, the fifth element of our incidental grouping will be introduced as a pay-to-stream title beginning 12 a.m. tomorrow, Wednesday, December 11, when Bloomington-Normal filmmaker and vlogger Griffin Hammond unleashes SRIRACHA, a half-hour documentary about the tangy dipping sauce of Thai origin that has found a cult following in the United States. Hammond visits overseas as well as Irwindale, CA-based manufacturer David Tran and Huy Fong Foods to understand better the cultural and culinary distinctions between various incarnations of this chili pepper condiment. Access to view SRIRACHA will run you $5; we’re unsure if a physical edition is on the way but we’d bite if it features the snazzy Matt Wiley poster art seen below as its packaging! Watch CUBlog between now and Friday for a follow-up report teasing the artwork, specifications, and ordering information of the THADDEUS and SCARY discs. Wouldn’t you agree they’d make unique gifts for the culturally savvy in your household? This entry was posted on Tuesday, December 10th, 2013 at 3:00 pm	and is filed under Broadcast Dates, Home Videos du C-U, Public Events. You can follow any responses to this entry through the RSS 2.0 feed. Both comments and pings are currently closed. Awesome round up, Jason! Thanks for the shout out!